A case study of teachers transforming pedagogical practices through collaborative inquiry-based professional learning in a ubiquitous technologies environment. The integration of digital technologies is positioned as a mechanism to reform or improve schooling through transformation of teachers’ pedagogical practice. Although availability and acceptance of digital technologies in schools has increased, evidence of wide-scale transformation is limited. Digital technologies are most commonly used to enhance existing pedagogies rather than transform them. Analysis of the literature indicates three factors remain unresolved. Firstly, new pedagogies associated with digital technologies are not well understood. Secondly, much of the current research is based on non-ubiquitous deployments and/or early stages of ubiquitous deployments. To date, there is very limited research evidence of the process of transforming practice in well-established ubiquitous technology environments. Finally, limited evidence of wide-scale transformation suggests current professional learning models are inadequate. Transforming pedagogy with digital technologies occurs at the nexus of extrinsic and intrinsic influences on teacher practice, and is complicated by the ever-changing nature of technology. The purpose of this research was to determine how teachers in a ubiquitous technology environment transform their pedagogical practice using collaborative inquiry-based professional learning. It is a case study of a team of six teachers seeking, over an eight-month period, to consciously transform their practice to realise personalised digital learning pedagogies. 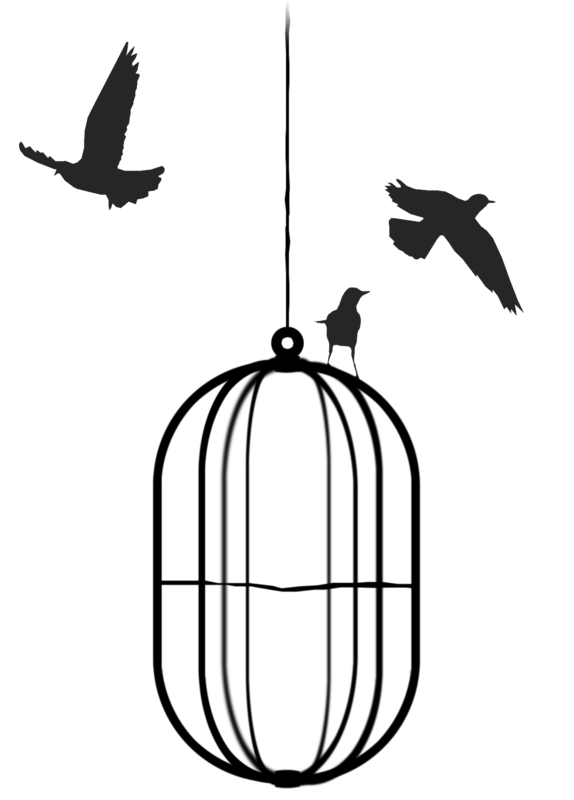 The teachers used the Tri-Theory Framework developed by the researcher to contextualise and conceptualise extrinsic and intrinsic influences, and then critique prior practice. Collaborative inquiry positioned the teachers as authors of new pedagogies. The teachers engaged with contradictions in their activity systems and disorienting dilemmas associated with changes in roles, relationships and actions. Degrees of pedagogical transformation and personal transformative learning were detected. The findings indicate pedagogical transformation was facilitated by collaborative inquiry and was dependent on personal transformative learning. Five factors contributed to pedagogical transformation. Collaborative inquiry gave the teachers authorship of the new pedagogies, allowing them to respond to their context. The Tri-Theory Framework allowed the teachers to contextualise and conceptualise influences, and critique their practice in preparation for making changes. Trust in collaborative professional learning and openness increased over the project, facilitating exploration of emergent challenges. Experience and student feedback resulted in increased confidence and trust in new pedagogies. The support and encouragement of colleagues facilitated engagement. Each teacher’s personal transformative learning was shaped by prior practice and experience. Teachers with more experience using student-centric pedagogies demonstrated greater transformation. Teachers with a positive attitude to innovation more willingly changed classroom roles, relationships and actions. The degree of transformation was linked to each teacher’s modes of transformative learning. More overt pedagogical changes were associated with frames of reference or habits of mind that valued diverse classroom roles. This research contributes to understandings about how teachers realise the pedagogical affordances of digital technologies. It elucidates the challenges of transforming pedagogies in the context of a well-established ubiquitous technology environment where enhancing pedagogy with digital technologies is common practice. The findings are significant because they, firstly, highlight the value of teachers using theoretical lenses to understand the complex influences on their practice, and secondly, identify the contributing factors to changes in practice. Implementing new approaches involved personal transformative learning for each teacher. This was shaped by prior practice, attitude to innovation, and willingness to explore new classroom roles, relationships and actions. Collaborative inquiry resulted in increased trust, openness and confidence. Blundell, C. (2017). A case study of teachers transforming pedagogical practices through collaborative inquiry-based professional learning in a ubiquitous technologies environment. PhD thesis, Queensland University of Technology, Brisbane. Blundell, C., Lee, K.-T., & Nykvist, S. (2016). Digital Learning in Schools: Conceptualizing the Challenges and Influences on Teacher Practice. Journal of Information Technology Education: Research, 15, 535-560. Blundell, Christopher, Nykvist, Shaun, & Lee, Kar-Tin (2015). Conceptualising the challenge of integrating digital technologies in pedagogy. In Finger, Glenn & Ghirelli, Paola (Eds.) Educators on the Edge: Big Ideas for Change and Innovation, Australian College of Educators, Brisbane, Qld, pp. 44-51. As part of his Masters of Education, in 2006 Chris completed a research project about how computer game technologies can be used by students to explore ancient wonders. 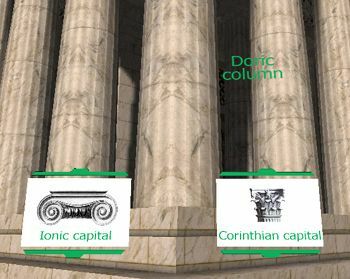 He created a virtual learning environment (VLE) of the Parthenon using the Unreal Engine. Built almost 2 500 years ago, the Parthenon is a testament to the cultural, scientific and artistic sophistication of the Ancient Greeks. Although the building has been damaged in war and stripped of many of its features, the architectural magnitude of the Parthenon is still clear. To genuinely appreciate the grandeur of the Parthenon, one needs to explore the Acropolis. Regrettably, this opportunity is unavailable to most people, making the development of a genuine appreciation difficult. VLEs provide a valuable, alternative experience. 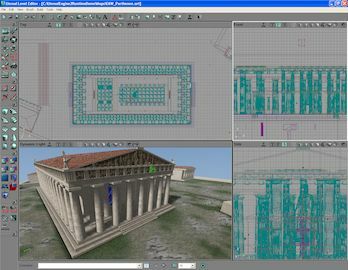 ‘Exploring Ancient Wonders: The Parthenon’ used computer game technology (version 2 of the Unreal Engine) to recreate the Parthenon in its original form. It allowed users to engage with this ancient wonder through self-directed exploration from a first-person perspective. Information about the history and architecture of the Parthenon was accessible to users at information markers and via a fly-by cinematic. The technology used and the level of detail included in the environment allowed the VLE to run on computers that were available for student use in 2006. Interactive markers were distrubuted throughout the environment. When activated, information about the particular feature was displayed. The VLE gave the students freedom to view the features of the Parthenon from any angle. As part of the activity, students completed an Explorer’s Journal worksheet. It included images of actual artefacts from the Parthenon. Students used thier learning to write an information statement for each artefact. For the purposes of the pilot study, the subjects were divided into two gender- and number-balanced groups using a treatment-control methodology. The treatment group used the VLE. 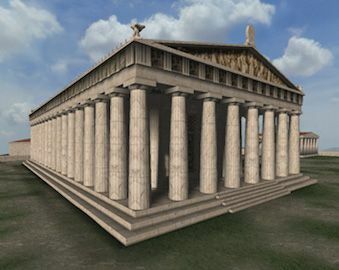 The control group used a WWW site containing all the information from and screenshots of ‘Exploring Ancient Wonders: The Parthenon’ for one hour. The pedagogical context was the same for both groups, making the environment in which the learning took place the independent variable. Pre- and post-test questionnaires were utilised to assess participants’ knowledge of the historic and architectural information presented, and their appreciation of the respective learning experiences and technologies. The findings indicated that the VLE was more effective in the development and retention of short-term knowledge than the WWW site. Males using the VLE demonstrated greater improvement in and level of knowledge, as well as greater confidence than males in the control group and females in both groups. The VLE and the WWW site had a similar level of benefit for female participants. The VLE demonstrated a similar level of effect for visual and multi-sensory learners (data for auditory and kinaesthetic learners was too limited). The self-guided, non-sequential nature of the constructivist learning experience promoted high levels of engagement for both groups, though subjects using the VLE demonstrated higher levels of appreciation for and engagement in the activity. Findings were presented at the 2007 QSITE Conference.